Culture and Tourism Minister Nabi Avcı, who opened the Turkish booth at the 51st International Tourism Stock Exchange (ITB) in Berlin, Germany, last week, said that German tourism sector representatives expressed discomfort about the harsh political discourse in recent weeks and that the Germans are trying to normalize this discourse. Stating that the Turkish tourism industry is expected to perform better in 2017 compared to last year; nevertheless, Minister Avcı said they are aware that this year's figures won't match pre-2016 levels. 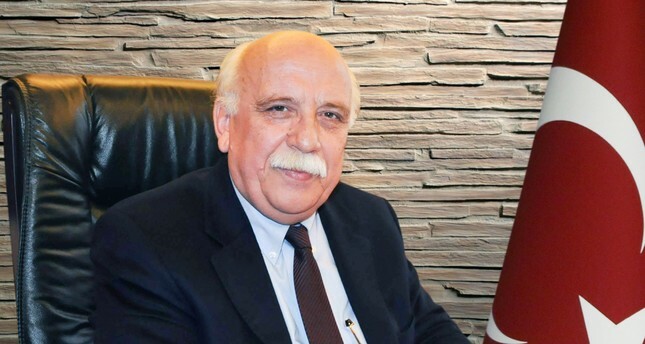 Commenting on strained relations with Germany and Netherlands, Avcı stressed that militants are systematically engaged in media and lobbying, a well-known method of theirs, in various European countries, including Germany and Netherlands, and they can trace that influence. Regarding Turkey's transition to a presidential system if the proposed referendum passes on April 16, Minister Avcı underlined that effective decision-making is the main feature of the presidential system and the tourism sector will be one of the most pleased about this transition. Daily Sabah: Last week, you opened Turkey's booth at ITB Berlin and held official talks. Germany is an important market for Turkish tourism. What were your observations in this regard? Nabi Avcı: As you said, I had the chance to meet representatives in the tourism sector and our citizens. It's the 51st anniversary of one of the most important tourism expos, and we opened our own booth and visited other booths. As I became the Minister of Culture rather recently, it was my first time at this expo; however, many of those who visited the expo say that the interest in our country's booth is extraordinary this year. Despite Germany and Turkey's harsh discourse against each other, many German citizens were interested in our booth. After the expo, I talked with people from both German and Turkish media and leading figures in the German tourism sector. Representatives of the German tourism sector are as discomforted as we are by the harsh political discourse, which they are trying to normalize. Germany is an important market for Turkish hotel businesses, while Turkey is an important market for German tourism companies and tour operators. Therefore, there is a reciprocal relation and the regression in our market also negatively affects the German one. We depend on each other; thus, I believe we were able to understand each other. DS: How will the Turkish tourism sector fare in 2017? N.A: Perception management is a crucial part of tourism. It's a sector that thrives if you believe it's getting better and that declines if you believe it's getting worse. Therefore, it is important to manage perception. I believe tourism will fare better in 2017 and 2018 than 2016. There are positive signals from Russian and English markets, while we observe similar signals from the German market as well. We expect 2017 to be better than 2016, but it won't return to the pre-2016 levels at the snap of a finger; we are pretty realistic in this matter. Disinformation and negative discourses about Turkey have affected our tourism sector negatively. When you face an issue, you have to confront it. Any guest country at the expo may believe that Turkey is the honorary guest of the expo, as we have undertaken our work with the utmost seriousness. Still, we have to be cautious. As the president urged, we call our citizens abroad to visit Turkey with their friends and neighbors and hold their vacations and wedding ceremonies in our country. There are many from India who come to Antalya for their wedding ceremonies, and they are very happy and pleased. In this regard, we want them to realize their engagement and wedding ceremonies in Turkey with their guests, surrounded by the beauty of the country. There will be incentives and discounts for our citizens abroad that want to realize these activities in Turkey. I want to announce that our campaign operators recently started promoting these incentives and discounts. DS: How do you evaluate the recent tensions in Turkish-German relations? The relation between Turkey and Germany was not recently established; it has a historical dimension. Therefore, it is not the kind of relation that will immediately suffer from certain actions. Still, we have to be cautious about our discourses against each other. As you know, FM Mevlüt Çavuşoğlu held talks with his German counterpart. Çavuşoğlu said that there was a reconciliatory ambience during talks and this allowed me to have rather relaxed talks with my counterparts. It was an exhausting visit, but the outcomes were good, which made me hopeful for the future. We were not pessimistic about future relations with Germany; however, the attention we received in the expo indicated that we must be hopeful. First, we received a clear signal that our relations in tourism will be improved. I'm saying this out of our experience with Russia. After the downing of the Russian aircraft, all aspects of relations between Turkey and Russia suffered. It was a problematic time period during which many of our business people and students in Russia faced certain hardships. However, we were able to salvage our relations later with the political will of our president. Our relations are improving by the day, and it may surpass previous levels. Our relations with Germany were not as strained as our relations with Russia. Therefore, I see the possibility of improving this relationship to a level that pleases both Turkey and Germany in a certain period of time. Still, this process is also not without its issues. It's clear that FETÖ militants are systematically engaged in media and lobbying, a well-known method of theirs in various European countries where they reside, including Germany and Netherlands. We can trace their influence in the strained relations. DS: During your visit to Berlin, you also attended a joint meeting with ministers of countries that are part of the Silk Road Program. Could you please tell us about what was discussed? The Silk Road Program is an initiative of the United Nations World Tourism Organization to revitalize tourism in countries that are on this road. Many countries, ranging from China to European ones, are working on the Silk Road brand and trying to determine what they can get out of it. The Silk Road has more recognized brand value than Coca-Cola. On the other hand, Turkey is the most important country on the Silk Road in terms of history and geography, as Turkey is a transit country. At the meeting, we talked about the Silk Road's importance in sustainable development. After all, the main theme of the UN World Tourism Organization (UNWTO) is tourisms role in sustainable development. For this reason, Silk Road projects were a part of the discussion at the meeting. The expo didn't have much to do with the Silk Road; however, as a significant number of ministers of culture and tourism were gathered at the expo, the UNWTO decided it would be opportune to discuss the Silk Road Program on this occasion. We held the floor three times. First, we explained what we have accomplished so far. Turkey has a separate Silk Road project, which was created jointly by Azerbaijan, Kirghizstan and Kazakhstan. Similarly, Kazakhstan and Kirghizstan have a similar project with China. Second, we stated the importance of restoring caravansaries in Anatolia for the project. We also said that we were ready and eager to share our experiences with other countries in this matter. Last, we talked about the role of gastronomy in the Silk Road project. Gastronomy is one of the fields in which Turkey has an affinity. While some cuisines are limited to local borders, ours transcends borders. We brought Turkmen cuisine from Central Asia, but also took different tastes from other regions on our way to Anatolia. After settling in Anatolia, we acquired elements of various cuisines of the Balkans, the Caucasus and the Arabian Peninsula. Thus, Turkish cuisine is an exquisite synthesis of all these elements. It's the richest cuisine of the Silk Road. DS:What is your opinion of the aims and final declaration of the Third Cultural Council that convened last week for the first time in 28 years? Considering that the first councils took place in 1982 and 1989, it was a necessity to hold this council to discuss policies, realized projects, projected initiatives and issues that we faced. We launched this initiative, as we believed it's necessary to continue with a new spirit and vision after 28 years. Our nation, which is the heir of a civilization that enriched itself through peaceful communications with various cultures throughout time, needed a new spirit and vision to employ its extraordinary cultural accumulation correctly and effectively. We had fruitful meetings on various aspects of culture with 17 commissions and 170 commission members. I can say that the council, which aimed to enrich Turkey's already rich cultural accumulation and designate a new course for culture policies, resulted in a stimulating road map, as 170 people of culture discussed Turkey's issues on culture for three days during meetings lasting until midnight. There were various commissions concerning music; media and culture; theater, opera and ballet; and cinema, radio and television. Each commission prepared reports in harmony. As the National Cultural Council, we proclaim "Turkey: for the common good." Turkey is one of the most important parts of the history of civilization and hosts some of the most cherished treasures of world cultural heritage. Our council clearly announced that Turkey would protect its language, country, culture and wisdom against all threats and attacks. We will not only protect our culture, our art, our literature and our values, but we will also improve them for the common good. We will do whatever we can as the state and the people. olster fields that require state support. Once more, we proclaim that we are determined to enrich our cultural life and stand together with all artistic activities, artists, writers and scientists. How do you evaluate Turkey's transition to a presidential system if the proposed referendum passes? How will it contribute to culture and tourism? First, I have to say that I hear many complaints from business people in the tourism sector about how slow the bureaucracy is. They complain that they face bureaucratic hardships and obstructions at every turn, from zoning plans to bids. If the main feature of the presidential system is swift and effective decision-making, which I believe it is, then the tourism sector will be one of the most pleased about this transition. After April 16, the presidential system will especially contribute to the tourism sector. Our citizens are also aware that the referendum is crucial for the preservation of stability. People know that their vote will result either in a stable, effective administration or ambiguity. DS: There are allegations that culture and art and literature will cease to exist and the Directorate of Religious Affairs will subsume the State Opera and Ballet. What is your response to these allegations? These allegations were also made when Recep Tayyip Erdoğan was the mayor of Istanbul in 1994. Moreover, it was part of the campaign against Erdoğan even before he was elected mayor. Even though it is hurtful, the use of "these" refers to a certain segment of society that reflects their mentality. At that time, they claimed the same nonsense: "When these come into power, they will fire all female employees who work for the municipality, close down all restaurants serving alcohol and force men and women to sit separately on the bus." When Erdoğan was elected, what happened? Water started to flow once again from the taps in people's homes, Istanbul's air was cleaned and transportation was rearranged. People familiar with conditions in Istanbul prior to Erdoğan's election know what I'm saying. People used to accumulate water in their bathtubs and various containers. Heaps of garbage were everywhere, and some were killed due to the explosion of accumulated methane gas. Nevertheless, were any of these baseless allegations realized? Not even one, no. However, did Erdoğan realize what he promised in his campaign? Definitely. Issues about tap water, transportation and garbage disposal were resolved, while Istanbul became greener. Now, they are trying to reiterate these wild accusations and baseless allegations. These are obsolete discourses that make no sense. To refute these allegations, I will provide some statistics about developments in culture and arts that were realized by the Justice and Development Party (AK Party). The number of culture centers increased from 42 in 2002 to 110 in 2016. While there were 93 museums administered by our ministry, it increased to 198; the number of visitors skyrocketed from 7.4 million annually to 17.3 million. There were 57 Turkish excavations in 2002, which increased to 112 in 2016. In parallel, the budget for archaeological excavations increased from TL 1.9 million to TL 27.5 million, increasing twenty-three fold. Moreover, while 2,525 artifacts were brought from abroad for 1992-2002, this increased to 4,270 for the years 2003-2016. While 59 private theaters received support from the state in 2002, the number of state-supported private theaters rose to 216. Similarly, financial support for private theaters increased to TL 5 million in 2016 from TL 850,000 in 2002. I should also point out that while there were nine sites on the World Heritage List, this number increased to 16 by 2016. Last, the number of stages increased to 65 in 2016 from 23 in 2002, while the number of operas and ballets performed increased to 843 from 584.